Barbie wants a holiday, but this is nearly impossible in the concrete jungle. Why don't you color yourself? Have you ever seen a girl with completely inappropriate outfit? 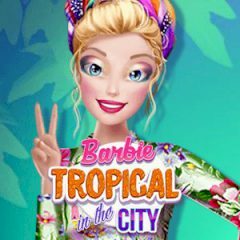 Well, Barbie seems like doesn't care and she will dress up tropically while in the city.